Falmouth Walking Tour - Barrett Adventures the Real Jamaican Adventures. 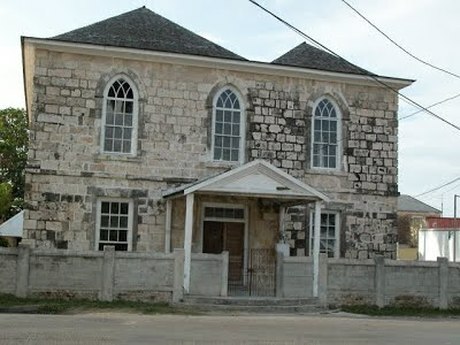 The old Baptist Church in the heart of downtown. The scale of the 18th century town is remarkably intact. Many of the buildings are dilapidated, but there has been little development and not only have large buildings survived but many delightful smaller one and two room cabins and even detached kitchens. This was the Barrett's town house. An hour's ramble or drive around Falmouth's classic six square block grid will bring into sharp focus the history of the area at the height of the wealth and power of the West Indian Plantocracy. We can also go a bit farther a field and inspect the famous plantations in the area, Good Hope, Kensington, Hampden, etc. Falmouth can also be done as a driving tour as part of the Rose Hall Adventure or, on the way to other activities.